Lauren Bakst and Yuri Masnyj, Living Room Index and Pool, 2015. 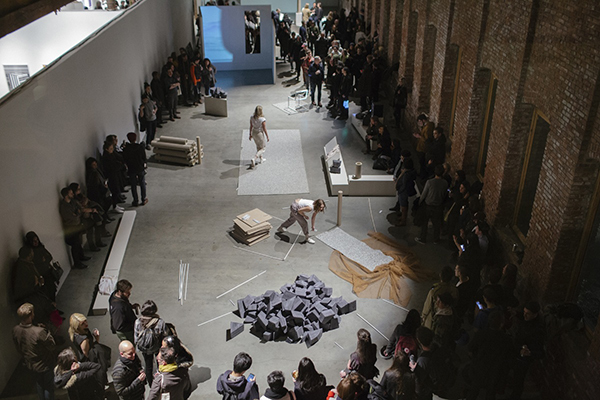 Performance view, Pioneer Works, Brooklyn. Lauren Bakst and Emma Geisdorf. Photo: Katrina Sorrentino. THE SUNLIGHT from the circular window high in the wall marks time in a shifting stretching oval on the floor. I am not quite sure what I am looking at, the various piles of construction and design-related materials, also maybe marking time on this long floor. I haven’t yet made the decision to look closely enough, always that decision when you walk into a gallery, like any conversation, whether or not to commit. I’m still getting my bearings at the echt Brooklyn arts-and-science compound that is Pioneer Works on a Sunday afternoon. Lauren Bakst and Yuri Masnyj’s Living Room Index and Pool is installed in an open-air gallery that runs almost the length of the Red Hook center’s ground level—her video and performance, his sculptural objects and arrangements, their installation. I guess I’m on a compare-and-contrast jag. Last month it was plays. This month it’s gallery shows—specifically collaborations between sculptors and choreographers, and specifically specifically between the sculptor Janine Antoni and the choreographer Stephen Petronio at Luhring Augustine and Bakst and Masnyj at Pioneer Works. Manhattan/Brooklyn, established/emerging, blue-chip/nonprofit… one could go to town on outmoded, accurate-ish binaries. The unfinished finish of Pioneer Works is a (too?) fitting container for Masnyj’s tidily untidy construction stuffs, stacks and piles and arrangements of wood and tubing and freestanding walls, which are themselves a deconstructed container for a series of duets by Bakst and Emma Geisdorf. On paper I don’t love this setup, which smacks of performance “activating” the white cube, that entrenched art-world trend that lacks faith in both the live and static arts as standalone ventures. But I think that rant-encapsulation says more about my tired eyes than it does about Living Room Index and Pool, which feels quite happily old-fashioned as a conversation between two people in search of a third possibility. Another way to say that is that the question “Would I be interested in these two things in isolation?” ceases to seem like a reasonable thing to ask shortly after Bakst’s performance begins, and the disparate parts snap into an elusive whole. Bakst and Geisdorf manipulate Masnyj’s quiet objects, moving things around to no discernible purpose like obdurate glitches in the system. They count. They make eye contact. They come just close enough before turning away and I notice that the moments of silence give me relief. There’s something compellingly unavailable about Bakst, as if she’s paying intense attention to something that isn’t in the room. Bakst has inserted two messy videos of water, one tropical and one arctic, on Masnyj’s clean white walls, and she and Geisdorf record themselves moving and posing in front of these fuzzy backdrops, inscrutable and awkward and strangely intimate. At some point they read from Theresa Hak Kyung Cha’s novel Dictée. “Her portrait is seen though her things, that are hers.” Of course these aren’t their things, are they? So many people who have come to watch are taking pictures, this is how they know to watch. When Bakst and Geisdorf exit their captured performances silently ghost the space. Those who come after us won’t notice any disturbances. It is raining and horrible when I visit Luhring Augustine. One thing Chelsea and Red Hook share: You have to mean it to trek over to them. Antoni’s show is called “From the Vow Made,” and there is no confusion about authorship. There is no real confusion about anything. The front gallery is taken up by a spare assembly of her milagros, resin cast joinings of domestic objects and body parts that are at once fantastical and didactic; basket weavings interlock with bones, body parts that only metaphors typically join are physically molded together: a head positioned on a rib cage as if listening for what isn’t there, in to long, 2014, or a hand cupping a section of spine in to return, 2014. Her collaboration with Petronio takes the form of Honey Baby, 2013, a video in the back room featuring the dancer Nick Sciscione turning and turning in artistic utero. I keep thinking of it as a prequel to Noémie Lafrance’s Melt, 2010. Why don’t I want to stay in this room? It all feels so head on. (But why does it feel this way? Is it enough to say I like that show, and not this one?) The idealized male body. The heartbeat. The dry bones leading to the womb. Antoni’s oft-stated turn to somatic practices as a way to cultivate embodiment feels like a naïve appropriation, no matter how deep her investment. The thing she is showing us corresponds exactly to the thing she wants us to see, and the titles are there in case we still don’t see. Only embodiment isn’t about seeing.